This painting is one of Carse's most ambitious and elaborate exercises in social genre. It was first shown to the public at the British Institution in 1819 while the artist was living in London. 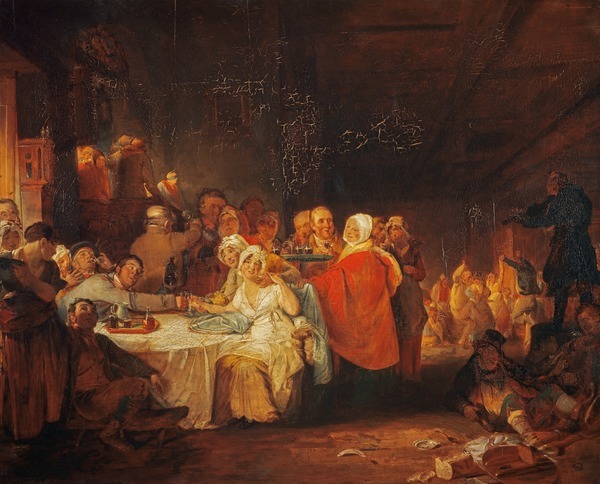 Carse evidently revelled in the raucous merriment and boisterous vitality associated with this distinctively Scottish custom whereby guests covered the costs of the wedding feast and any surplus was used to set up the couple in their new home. Carse filled his composition with all sorts of humorous narratives. On the right of the picture two farmers or shepherds are gorging themselves on ham, while a third pulls down his bonnet to say grace. Behind them a pair of men are bickering over their voluntary contributions as the hat is passed round.